Feb 24, 2015; Winnipeg, Manitoba, CAN; Dallas Stars defenceman John Klingberg (3) prior to the game against the Winnipeg Jets at the MTS Centre. 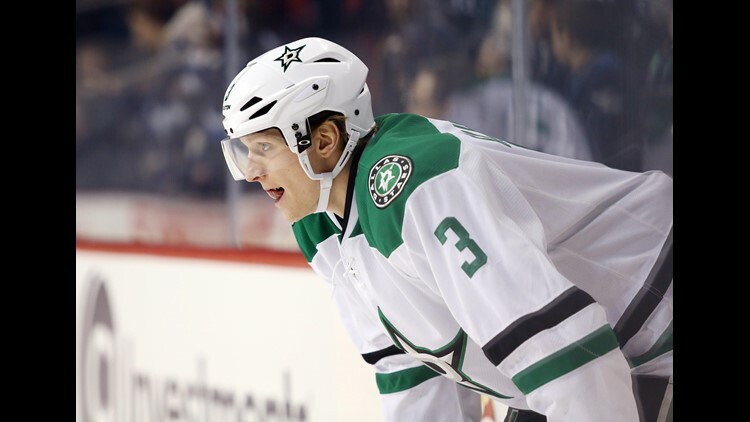 Dallas Stars defenseman John Klingberg has been missing on the ice ever since an upper-body injury during a Nov. 8 game against San Jose put him out for at least three weeks. But his jersey has been worn a few times in the American Airlines Center in his absence. Klinger’s Kids, a program Klingberg started this season to give back to the community, gives children who have life-threatening illnesses the opportunity to watch the morning skate, tour the locker room, and get four tickets to an upcoming game— and receive a #3 jersey. One of those children is 6-year-old Aiden Norris, who has stage 4 neuroblastoma and is also autistic. He attended a game through the program shortly after the one-year anniversary of his diagnosis. So far, Aiden is one of three children that have been selected to be a part of the program, according to The Athletic. For more information on the Dallas Stars Foundation and Klinger’s Kids, click here. The Stars’ next home game is Friday night against Boston at 7 p.m.